Recently, the Lee County Visitor & Convention Bureau’s research firm, Davidson-Peterson Associates, surveyed visitors in the last three months of 2012 about the Lee County attractions they visited. Cayo Costa Island State Park: You can only get here by boat but it’s worth it. The secluded barrier island with a 2,426- acre park is great for shelling, swimming, camping and fishing. With some nine miles of shoreline and no road access, you can unplug from the world and find some unforgettable shells. Turner Beach: Situated between Sanibel and Captiva islands on Blind Pass, this beautiful beach is prime shelling territory and an excellent vantage point for West Coast sunsets. Parking is limited and fees vary, depending on which side of Blind Pass you park. Location: 17200 Captiva Dr., Sanibel. Bowman’s Beach: This beach requires a five-minute walk along a path, over a small bridge, to the beach from the parking lot. The effort is worth it because miles of shells await your arrival. Picnic tables, grills and restrooms are available. Bike racks and nature trails are also available to visitors. Pets are allowed but must be leashed. Parking costs $2 per hour. Location: 1700 Bowman’s Beach Road, Sanibel. Lynn Hall Memorial Park: Located in the northern section of Estero Island in the Times Square shopping, dining and entertainment district in Fort Myers Beach, this park provides the perfect setting for family outings. 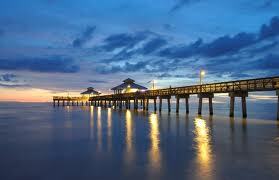 It sits next to the beach and popular Fort Myers Beach Fishing Pier that stretches 600 feet into the Gulf. Families can swim, shop, enjoy the playground and choose from hundreds of ice cream flavors. Location: 950 Estero Blvd., Fort Myers Beach. 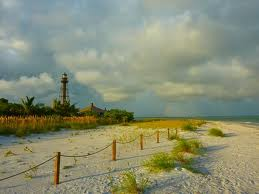 Sanibel Lighthouse Beach: Located on Sanibel Island’s southern tip, this beach is the site of the picturesque 100-plus-year-old functioning lighthouse. 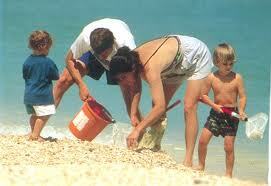 It is outstanding for bird watching, picnicking, taking a stroll down the beach or fishing from the pier. Nature trails and boardwalks are available. There is a $2 an hour parking fee. Location: 1 Periwinkle Way, Sanibel. Bonita Beach Park: This beautiful beach on Little Hickory Island is located between Fort Myers Beach and Bonita Springs. The four-acre pristine beachfront park features a boardwalk to protect the sand dunes and coastal vegetation surrounding a gazebo and eight picnic shelters with tables and grilles. Bathrooms, changing rooms, outdoor showers and sand volleyball court are all features of this park. Parking is $2 an hour. Location: 27954 Hickory Blvd., Bonita Springs.